Goal: cut our teeth on a smaller scale renovation project in a great urban location and address the void of transit-oriented affordable housing for elderly residents by redeveloping a dilapidated building with walkable access to downtown Phoenix. 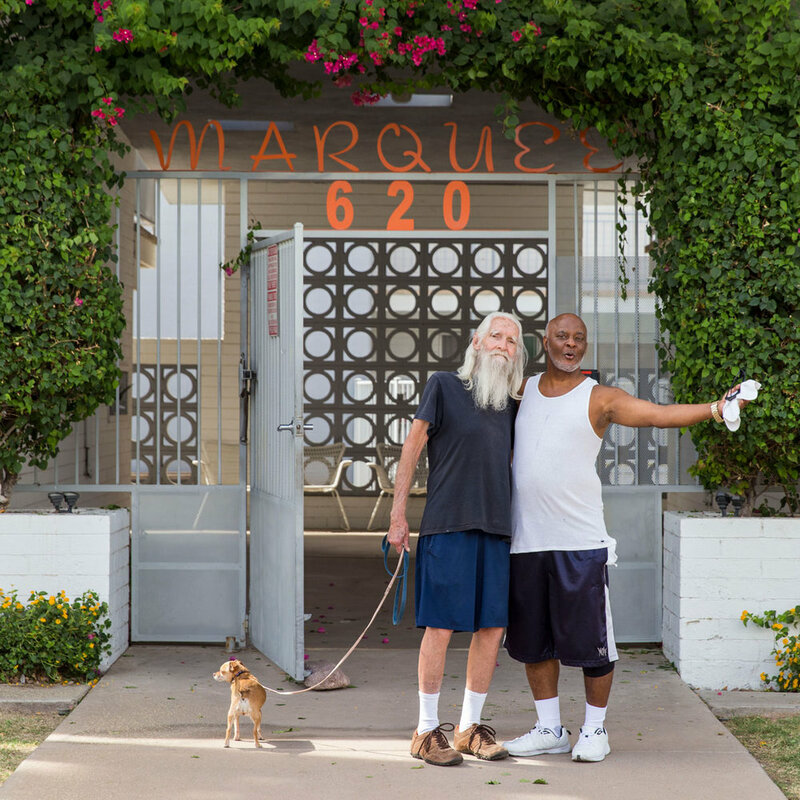 Located in the Roosevelt Row arts district in downtown Phoenix, the Marquee provides housing for low income elderly residents who have incomes between 40% - 60% of the County Area Median Income in 34 rental units. We preserved the mid-century architectural feel of the property through a thoughtful renovation process. Housing for seniors is not readily available in an urban setting with the typical senior housing being located in more remote or suburban areas of the greater Phoenix valley. As downtown Phoenix was beginning to feel the evolution of a national urban renaissance and more and more businesses and services were beginning to take hold we wanted to create housing that allowed low income seniors access to housing in the middle of the urbanizing action. The energy created by the activity downtown coupled with the extremely convenient access to amenities and services were compelling reasons to pursue the redevelopment of the 1950’s building. Included amenity spaces are: a pool, an outdoor eating and bbq area, and a community room with common computer. Services include classes on health, wellness, and financial literacy as well as social community building activities. The Marquee was one of the first two projects that CDP was awarded funding on in our first year of business, 2012. Fortunately we had a relatively patient Seller due to a soft real estate market in Phoenix which provided us with the time to prepare and submit a 9% LIHTC application to the Arizona Department of Housing. This was our first experience in Arizona, our first go around with 9% credits, and our first renovation project. La Frontera is a community behavioral healthcare organization that provides resident services at Marquee including case management, resident engagement, social activities, financial classes, and health and wellness eduation. CDP engaged long time local artist Hugo Medina to connect with the residents of Marquee in a focus group setting to understand the diverse backgrounds and perspectives of the community in order to inform the subject matter for a publicly visible mural on the building. In a show of community bonding a consensus was found with a nod to the historic nature of Roosevelt Row with the final selection being Teddy Roosevelt. He still proudly presides over The Marquee and keeps a watchful eye on the community.